Hi Theodora, and welcome! I don't have any answers for you, but someone around here will. Kick off your shoes and get comfy, this is a great place to hang out. I don't know when those films will be released, but they both appear on TCM once in awhile. I checked some sites that have dvd's of rare films, but I could not find Two Guys from Texas, which is my favorite of the Dennis/Jack films. Once in a while ioffer has The Desert Song listed, but not recently. I am glad you started this thread. Dennis Morgan is an underrated actor. 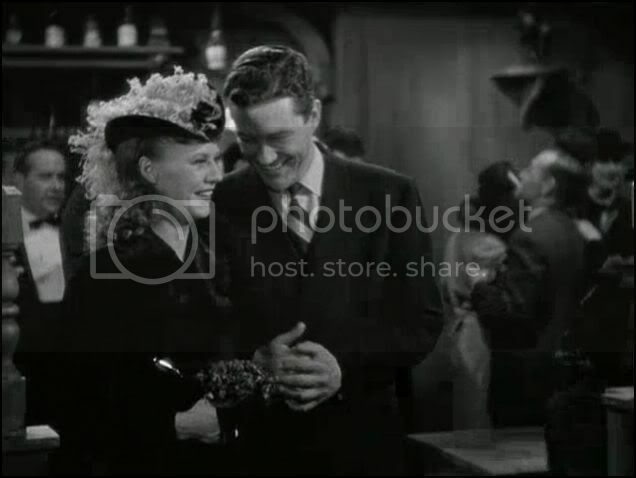 With Ginger Rogers in Kitty Foyle (1940). My favorite Dennis Morgan films are: The Hard Way, In This Our Life, The Very Thought of You, God Is My Co-Pilot and Shine On, Harvest Moon. I always thought that as a utility player at Warners, Morgan was always rather under-appreciated, often being paired with bigger female stars whose electric presence, flamboyance or grittiness were cast in high relief against his gentle, quiet manner. 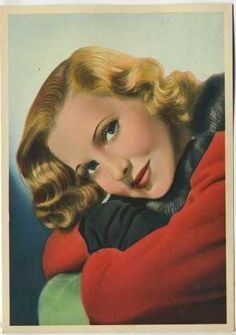 This is particularly noticeable with Ida Lupino (The Hard Way), Bette Davis (In This Our Life) and Joan Crawford (This Woman Is Dangerous), though my favorite co-star for Morgan may have been Ann Sheridan, an actress who made every actor she ever appeared with on camera seem somehow better. Musically, despite his Swedish ancestry, when cast as a kind of Irish charmer with a sweet but manly tenor, Dennis could often be very entertaining, and I thought he was great in Shine On, Harvest Moon with two performers I cherish, Jack Carson and Ann Sheridan. I also loved My Wild Irish Rose as a child, though I was too naive to understand the black face sequences, which now seem so grotesque and make the film unwatchable for me unless I fast forward through those minstrel show scenes. I do love the part of the film when Chauncey Olcott (Morgan) sings for his Mother (Sara Allgood, of course, unless of course, Warners favorite ersatz Irish Mom, the Scottish-born Mary Gordon wasn't available!?) in an empty theater with only the cleaning ladies as witnesses. Sentimental, sure. But done with such straightforward emotion it somehow works thanks in large part to Morgan's ability to present a song in a sincere and effective way. One film of Morgan's that I recently saw for the first time was in the interesting Perfect Strangers (1950), with Dennis and Ginger Rogers as members of a jury who are sequestered while deciding the fate of a man accused of murdering his wife. Despite the presence of these two musical veterans heading the cast the dramatic script, from the Ben Hecht and Charles MacArthur play, "Ladies and Gentleman," was a courtroom drama, which did a good job of delineating the various jurors' personalities (among them was Thelma Ritter, so I just had to see this one! Other character actors sprinkled throughout the film are Harry Bellaver, George Chandler and Alan Reed, whose faces are immediately recognizable, even if their names are not). Morgan and Rogers fall in love, though the ending of their story is hardly what one would expect. 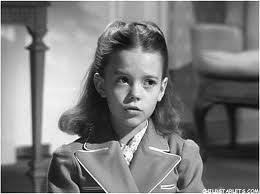 Not a great movie, but a delicate subject treated with some unusual maturity for an American film in the '50s. A film that I would love to see, but which seems to be in copyright limbo is The Desert Song (1944) with Morgan and Irene Manning in the leading parts of the operetta, (seen above) which in this version became a story of the Oppressed vs. the Nazis in North Africa. Has anyone ever seen this film? It appears to be in existence, since there are reports that this film was remastered and shown in revival theater setting in the '90s. 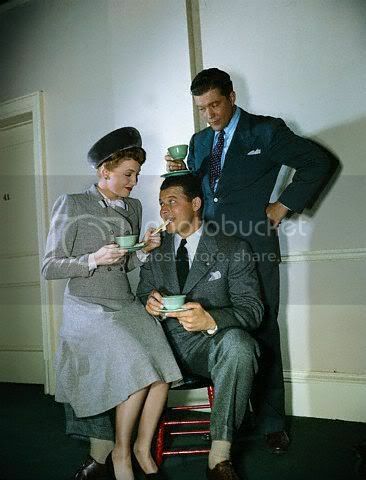 Dennis Morgan with Jack Carson and Joan Leslie in their Warner Brothers years. I know that the internet archive has a copy of "The Desert Song" radio play under screen guild theater, i think. I have listened to the radio play - only thirty minutes, and i liked it. I liked Gordon MacRae - he had a beautiful voice, but I liked Dennis Morgan better in this version of "The Desert Song." I also liked the plot better. I also read that there was a 1990's showing of "The Desert Song" that has been remastered. I wonder if there is anyone on this board that knows anyone at Warner Brothers that could help in getting this dvd released. I have requested it several times and gotten generic answers. I sure would love to see this film. Thank you all for your responses. I love to hear from others who are interested in classic films. theodora wrote: I know that the internet archive has a copy of "The Desert Song" radio play under screen guild theater, i think. I have listened to the radio play - only thirty minutes, and i liked it. I liked Gordon MacRae - he had a beautiful voice, but I liked Dennis Morgan better in this version of "The Desert Song." I also liked the plot better. I also read that there was a 1990's showing of "The Desert Song" that has been remastered. I wonder if there is anyone on this board that knows anyone at Warner Brothers that could help in getting this dvd released. I have requested it several times and gotten generic answers. I sure would love to see this film. Thank you all for your responses. I love to hear from others who are interested in classic films. I will ask a few people who might be in the know, but I think that the problems with The Desert Song (1944) may be related to copyrights that have lapsed. This all sounds silly to those of us who would just like to see the film again, but in legal terms, tracking down the rights and getting the releases needed to broadcast a film gets complicated and expensive. There is probably an effort behind the scenes to make this available, but the fact that it still exists at all is certainly good news. Do you have any particular Dennis Morgan films that you like? What appeals to you about him? The Desert Song (1943) is available from www.robertsvideos.com but do not buy from them unless you are really desperate. 5-Sep-1933 Married Lillian Vedder and on 7-Sep-1994 Separated after 61 years by his death. 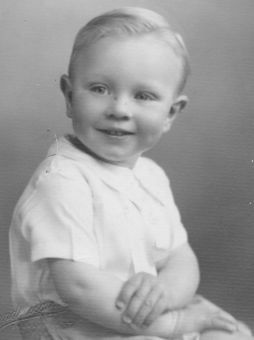 As a young man performed in the operas Faust and Carmen. 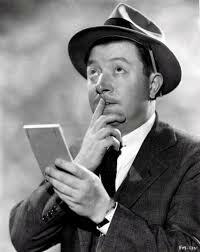 Was originally cast to play Rick Blaine in the movie Casablanca, but made Thank Your Lucky Stars (1943) instead. First under contract to MGM, then Paramount then Warner Bros. Appeared in the finale of The Great Ziegfeld (1936). His voice was dubbed by Allan Jones. In October 1959, sang at the funeral of his friend Errol Flynn. Once said “It`s not the easiest thing in the world to be a success in Hollywood and still be the ordinary husband and father”. I loved what you had to say about that scene in his room where he was singing to himself, Ingenue! That was beautifully put and a very accurate description. I agree about his motivations. He seemed so genuinely happy after the scene right before the song where she told him she didn't believe his jerkiness and that he could protest all he wanted, she would never believe he was a bad guy. Almost relieved that she saw through him. I've enjoyed reading all the information on Dennis Morgan but having re-read INSIDE WARNER BROTHERS, executive producer Hal Wallis states clearly in a memo to Jack Warner that Humphrey Bogart is ideal for Casablanca and that the part of Rick is being written for him. This response was after Warner himself had been approached by George Raft about the part. So Raft didnt 'turn down the part'. I haven't seen Dennis's name as possible casting . Aahhh... I come on over here and find not only Moira's beautiful piece on Dennis Morgan, but praise for a bit of my own writing as well. ( Wendy: Thank you. ) This is the life! I feel he's terribly miscast in KITTY FOYLE. There's nothing Main Line about Dennis, which I think is part of his great appeal. Would you go a little further with this for me? 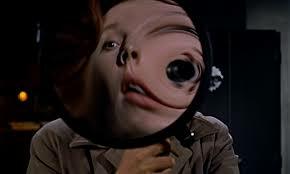 I don't think I've ever met real 'Main Line' so, meeting the reel counterparts of it last night ( a fresh viewing of "Kitty Foyle" ), I began to wonder what you felt was lacking. Or have I come at your comment from the wrong direction? I caught a few minutes of Dennis Morgan in Kitty Foyle: The Natural History of a Woman (1940) this afternoon. I was utterly charmed by his self-deprecating performance, which seems so effortless. 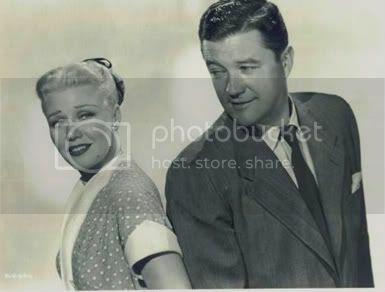 He was especially good in his scenes with dear Ernest Cossart as Pop Foyle, and this scene, which takes place after Kitty (GInger Rogers) has dreamily let slip that her boss' voice "does something to her..."